It is 1914, and the war in Europe means that tensions are high. In the city of Chester the alarm has been raised. A week after the despatch of Britain’s expeditionary force, an aeroplane and an airship have alighted on the Chester’s racecourse, the Roodee. The men aboard report that a hostile force has occupied Llandudno, damaging and holding the railway line to Holywell Junction. From another ‘plane comes a report that a hostile motor launch, approaching Chester via the river Dee, has been driven back by rapid fire from the guns of the Depot Cheshire Regiment. The Cheshire Territorial Brigade has been mobilised, and Chester’s Voluntary Aid Detachments (part of the British Red Cross Society or BCRS) have been called to the Roodee to set up a makeshift hospital for the wounded. The dramatic state of affairs I have just described was thankfully not a real-life situation. It was in fact the scenario which faced Hope [ ] and Hester [ ] Atcherley and the other VAD members who participated in a training exercise, on the eve of Britain’s entry into the war in Europe. The exercise took place during the last week of July 1914, and involved six women’s Voluntary Aid Detachments from Chester, plus one men’s. Hope and Hester had (along with their former school head mistress Beatrice Clay and 22 other young ladies) just passed a first-aid examination and attended a course of lectures in home nursing – now they had an opportunity to put what they had learned into practice. One of the many lessons which the South African War taught this country was that its arrangements for medical and hospital work at the bases and in the field were seriously defective in organisation. There were too many societies taking part in the work, with too little co-operation and understanding between them. It was realised that the various leagues which were prepared to help the Army in its care of the sick and wounded must be amalgamated and directed from a central control. This was done. The British Red Cross Society, an organisation embodying under one name and administration a number of hitherto separate societies, was formed in 1905. It can call upon 60,000 persons, many of them highly trained, to undertake field ambulance and hospital work. The services of this great army of helpers throughout their training, which includes many an arduous day’s work at sham fights and displays, are given without any hope of reward, and often without acknowledgement. If they were called upon for serious work to-morrow, at least 95 per cent. would obey the call. 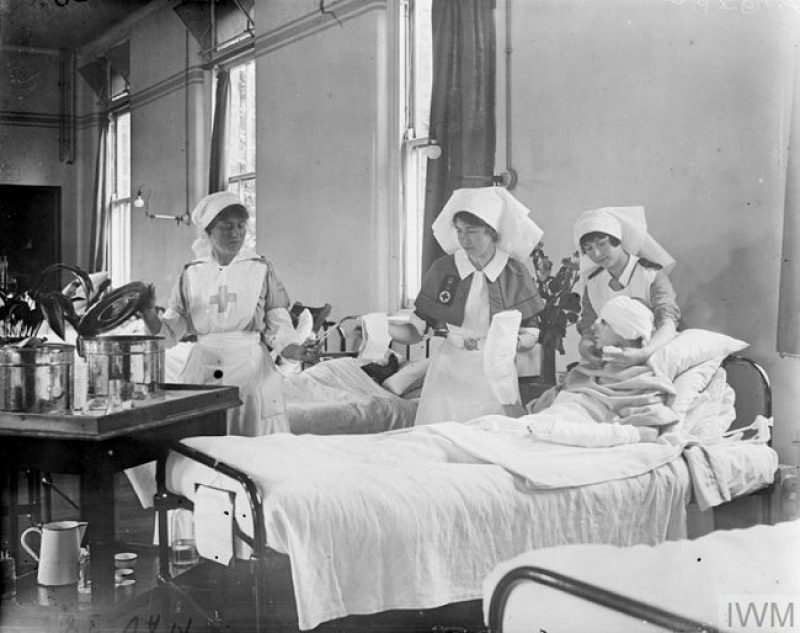 The British Red Cross Society does not exist, as has sometimes been thought, to undertake itself the whole work of ministering to the sick and wounded. It is purely a contributory body. In time of war it would act under the directions of the Admiralty and the War Office, and its activities are limited by the nature of the war and of the climatic conditions under which it is being fought. The forms of aid which the society is prepared to supply are many. They include the provision and equipment of hospital ships and trains, hospitals and convalescent homes, hospital requisites, medical comforts, and food. To these may be added chocolate, playing cards, games, stationery, pipes, and tobacco. Hope (or Mary Elizabeth Hope, to give her forenames in full) and Hester (Hester Mary Eleanor), then aged 20 and 19 respectively, were part of the Trinity Voluntary Aid Detachment. This was headed by a Commandant, a Sub-Commandant, a Quartermaster and a Lady Superintendent, and in addition to Hope and Hester there were 15 others assigned to General Duties, plus a Cook. The vice-president [of the Chester Division of the Cheshire Branch of the BRCS], Lady Mackinnon, with [the] voluntary aid detachments, occupied the Roodee race buildings, a dressing station was formed, and the race buildings were fitted up as a hospital for twelve beds, and capable of expansion. At the dressing station near the railway bridge over the Roodee, the medical officer in charge was ready to perform the most urgent operations on an improvised operating table, supplies of restoratives and stimulants being available to be ordered by him as necessary. A voluntary aid detachment was on duty at the dressing station to supply first aid under his direction, and ambulance wagons were available to transport the cases to the temporary hospital in the race buildings. As each case arrived at the hospital, the admissions were entered, and the medical comforts were ready to be given as ordered by the medical officer in charge, who supervised the replacement of the first aid dressings as soon as possible, the installation of the patients in the temporary hospital, the establishment of hospital routine, and the performance of any postponed operations. On Tuesday the nurses were on duty from 10 a.m. until 6 p.m., and they spent time in preparing for their expected patients. On Wednesday the scheme was that another motor launch and a light torpedo craft was reported as passing Queen’s Ferry, and the Depot Cheshire Regiment again turned out, and by rapid fire forced them back. Nine casualties were brought to the hospital, their supposed injuries being as follows :—A trans. wound in the abdomen, a broken vertebral column, a fractured collar bone, a fractured upper arm, a fractured thigh bone, a fractured knee cap, a shell wound in the forehead, a bullet wound in the left thigh, and a bullet wound in the calf of the right leg. In dealing with these the nurses gave every satisfaction, and a visit to the hospital while they were at work could not fail to convey the utmost confidence. Bandaging, setting of limbs, and dressing of wounds was carried through with expedition, great skill and the utmost tenderness, and all who took part deserve the highest congratulations. On Thursday the scheme was the same as that on Wednesday, the twelve casualties brought to the hospital that day having the following injuries: Vert. wound in the abdomen, a fractured spine, a shell wound in the left arm, a fractured clavicle, a fractured humerus, a fractured femur, a fractured neck radius, a fractured ulna, a fractured patella, a scalp wound, a bullet wound in the left thigh, and a bullet wound in the right calf. Yesterday (Friday) motor launches and light torpedo craft in force were reported as passing Queen’s Ferry, with the probable intention of destroying the bridges and the hydro electric power station. The Depot Cheshire Regiment again turned out, with all the available Territorial Force, and repulsed the advance. On this occasion there were seventeen injured to attend to, and again the nurses did their work admirably. In addition to the exercises which were carried out, there were lectures which were given by officers from the Royal Army Medical Corps. My guess is that Hope and Hester Atcherley would have attended one or more of these. It all helped to prepare the VADs for dealing with real casualties of war – and those casualties were not long in coming. 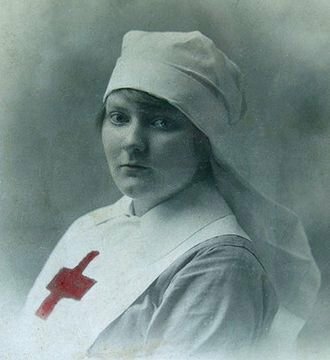 Just days after the Cheshire newspapers carried their reports of the “busy week” of the “Red Cross nurses”, Britain officially joined the conflict in Europe – a conflict which extended to so many parts of the globe that it became the first world war. The Atcherleys of Chester – Hope, Hester and their widowed mother Caroline – contributed to the war effort in various ways. A list of the city’s subscribers to H.R.H. The Prince of Wales’ National Relief Fund, published in the Cheshire Observer of 22 August 1914, included “Mrs. Atcherley’s household” and their contribution of 12s 6d. Caroline would make many more donations to funds such as this in the years that followed. Her daughters got involved in other ways. One or both of the Atcherley girls were active with the “Baden Powell Girl Guides”. In June 1915, under the leadership of “Miss Atcherley”, the Girl Guides of Hoole competed with two other local teams (Saltney and the 1st Cheshires) in a test of drilling, first aid, flag signalling, knots and appearance. This took place as part of a programme of entertainment for “a party of deaf and dumb, and wounded soldiers from Saughall”. After tea, and the presentation of a banner to the winning Girl Guide team (Saltney): “Socks were then given to the head girl of each troop for presentation to a soldier friend”. Record cards kept by the British Red Cross provide more information about the nature and extent of Hope and Hester’s voluntary work as VADs. The single pink card for Hester records her duties as “Pantry work & nursing Hoole House Hosp.” It also states that between December 1914 and December 1917 Hester worked a total of 4,158 hours. Hope meanwhile, carrying out the same work at the same hospital according to her pink card, completed 6,984 hours between December 1914 and January 1919. If I could go back in time, I would acquire a hat and take it off to these amazing Atcherley sisters. Picture credits. 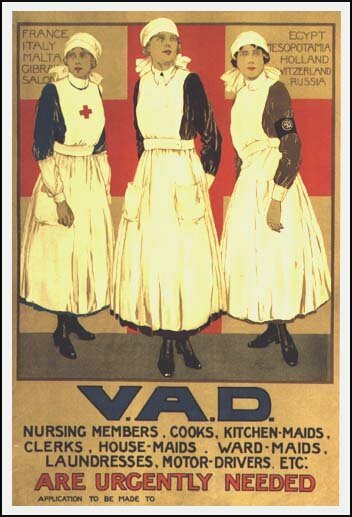 VAD poster: Image from Wikimedia Commons; likely to be copyrighted, but copyright owner unknown – ‘fair use’ exception claimed. VAD Nurse Violet Alicia Aplin: Adapted from a public domain image at europeana. Nurses, assisted by a VAD nurse, with patient in WW1: Photo © IWM (Q 18950), taken from the IWM website and used under the terms of the IWM Non Commercial Licence. The Cheshire Observer, 1 Aug 1914, page 10. Copy viewed at Findmypast. Chester Chronicle, 1 Aug 1914, page 8. “THE RED CROSS NURSES.” Copy viewed at British Newspaper Archive. The Cheshire Observer, 22 Aug 1914, page 8. “CHESTER & THE WAR.” Copy viewed at Findmypast. Chester Chronicle, Saturday 19 Jun 1915, page 8. “DIOCESAN MISSION TO THE DEAF AND DUMB.” Copy viewed at Findmypast. Beatrice Clay (ed.) (1915), Have Mynde, The Queen’s School Annual, July 1915. Copy downloaded from The Queen’s School website’s Have Mynde archive. Beatrice Clay (ed.) (1916), Have Mynde, The Queen’s School Annual, June 1916. Copy downloaded from The Queen’s School website’s Have Mynde archive. British Red Cross. Personnel record card for Hester M E Atcherley. Copy viewed at the British Red Cross website. British Red Cross. Personnel record card for Mary Eleanor [= Elizabeth] Hope Atcherley. Copy viewed at the British Red Cross website.